To prevent the bug that ruined Florida’s citrus industry from taking hold in South San Luis Obispo County, Bee Sweet Citrus plans to build a facility that could wash and wax harvested citrus before it’s transported farther south. The 14,900-square-foot facility was part of the South County Advisory Council’s consent agenda on Jan. 28, and the council recommended that the SLO County Board of Supervisors approve the project. Bee Sweet would use 125 to 250 gallons of water per day to remove leaves and material from citrus that could host the Asian citrus psyllid, a bug that could carry citrus greening disease. The disease destroyed 24 percent of Florida’s citrus production at a loss of $344 million, according to 4th District Supervisor Lynn Compton’s staff. All of SLO County and Santa Barbara County are proactively on quarantine with no end in sight, and the California Citrus Research Board has spent 75 percent of its research funding on finding a solution, according to Bee Sweet Vice Priesident of Farming Keith Watkins. “Until we have a solution for the disease, the quarantine will be there,” Watkins said. Watkins said workers will also wax and sort the fruit, and Bee Sweet Citrus is open to contract their services with other growers in the county. The washline would be the first in the county—an alternative to workers hand-removing leaves, which could allow some psyllids to slip through the cracks, and insecticides that kill the bug but are toxic and costly, San Luis Obispo County Assistant Agricultural Commissioner Marc Lea said. Citrus greening disease has not been found in San Luis Obispo County, but growers are on edge as citrus psyllids have been found in residential neighborhoods, indicating that the bug has been brought up by travelers who bring back produce from growers with the bug, Lea said. Lea said people accidentally bring infected produce into the county after buying them elsewhere, or the pests “hitchhike” on cars and clothing to get to the county. 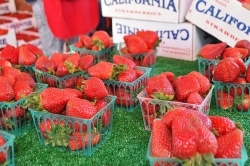 Watkins recommended that people not transport fruit from place to place, that people ask where fruit came from and whether it was sprayed and cleaned if they are buying it directly from farmers.